This is such a late Thanksgiving post! I totally fail. But since M and I have moved in together ... we were celebrating our first Thanksgiving. So I decided to make a little meal for the two of us, since we weren't going to be in town during Turkey Day (hello, Vegas!). 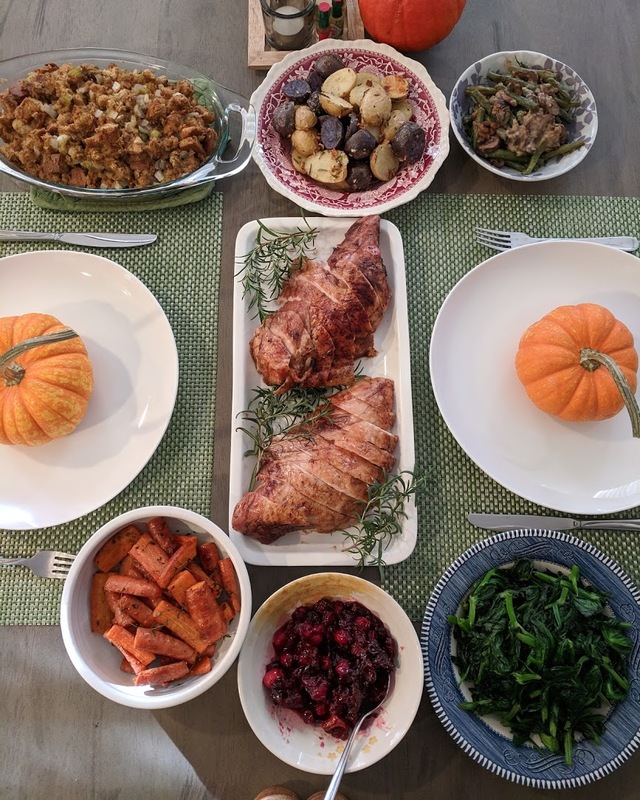 We went to Sprouts and I bought a turkey breast - it was $3.99/lb which is a little steep compared to the entire turkey selling for $0.79/lb but an entire turkey is SO MUCH TURKEY for two people. Even the smallest whole turkey was 12 lbs. So even though the turkey breast was the same cost as an entire turkey, it made more sense for the two of us. Though I did miss the dark meat. The turkey was brined overnight with cider, brown sugar and salt ... then roasted to juicy turkey perfection in about 90 minutes. I made some stuffing from the box, roasted some tri-colored potatoes with garlic and rosemary, roasted some carrots with thyme, cranberry sauce and sauteed some pea shoots. 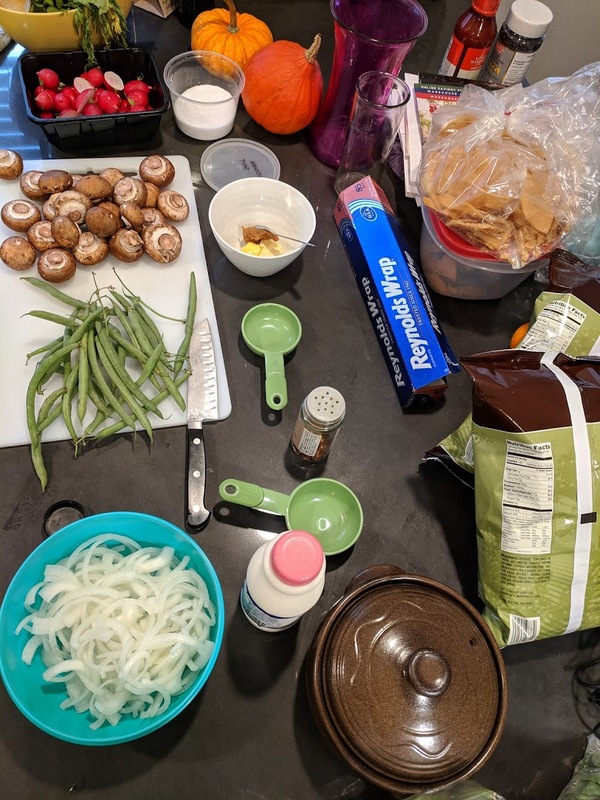 The green bean casserole (top right corner) was leftover from our Friendsgiving the night before and I was lucky to snag that little bit because people went CRAZY over it. So much better than the old school version which involves opening multiple cans. To make the onions, toss all the ingredients (minus the oil) together thoroughly. Heat about 1/2 an inch of oil in a cast iron pan over medium heat. Test the heat of the oil by dropping in one drop of water. Once it hisses, it will be hot enough for frying! Fry onions in handful batches (it'll probably take you 2-3 batches) until they're golden brown. It'll take a bit longer than you think. Remove with a spider or slotted spoon and spread them on a paper towel to drain excess oil. Preheat oven to 400degreesF. Bring a large pot of salted water to a boil. Cook green beans on a full boil for 5 minutes. Drain and then put in an ice bath immediately to keep the green color. Once cooled, cut green beans into 2 inch pieces. Over medium-high heat, melt butter in a large saucepan. Add mushrooms, salt and pepper and sautee until they release their liquid and are nicely browned. It'll take anywhere from 7-10 minutes. Add garlic and cook for another minute, then add flour and stir to evenly coat all the mushrooms. Add the broth slowly, 1/4 cup at a time while stirring the whole time. Try to mash through any lumps with the back of your spoon/spatula so the pieces break up and melt into the sauce. Simmer for a minute to cook off the raw flour taste. Pour in cream, stir thoroughly and then bring back to a simmer, cooking until the sauce thickens up, about 5 minutes. Stir frequently. Mix in cooked, drained green beans and stir until coated. Pour into casserole dish and top with the crispy onions. Bake for 15 minutes, until sauce is bubbly and the onions are a bit darker. Eat hot! The cake you see above was made with fruit that would have been abandoned! And the thing I absolutely hate the most is wasting food (and cockroaches, but that's another story). There's something about wasting food that makes me angry. Maybe it's all the hungry people in the world or the thought of wasting hard-earned money. In any case, we bought some blackberries at Sprouts and after one berry, M refused to eat any more because we didn't get a good batch - they were admittedly very sour. He wanted to trash them but I said "NO, I'll just turn it into cake!" 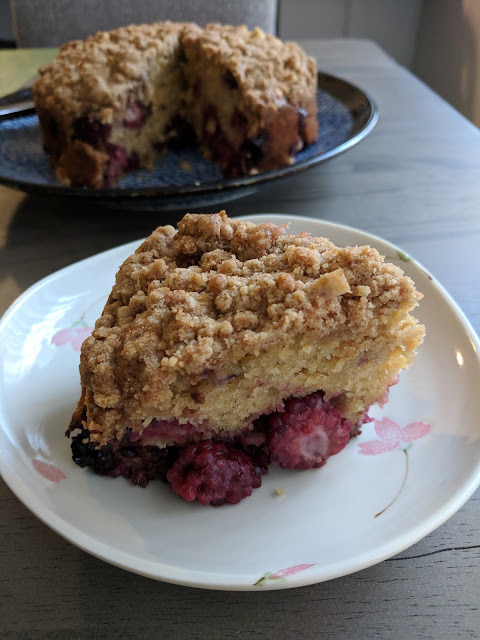 So I used a recipe from Half Baked Harvest to make our blackberries edible again. Preheat oven to 350degreesF and spray a 9" spring form pan with nonstick cooking spray. In a small bowl, gently combine berries and lemon zest. In a large bowl, whisk together the dry ingredients. Once thoroughly combined, add the butter, milk, eggs and vanilla. Mix just until combined, being careful not to over mix. Pour the batter into the prepared pan and top with the berry mixture in an even layer. 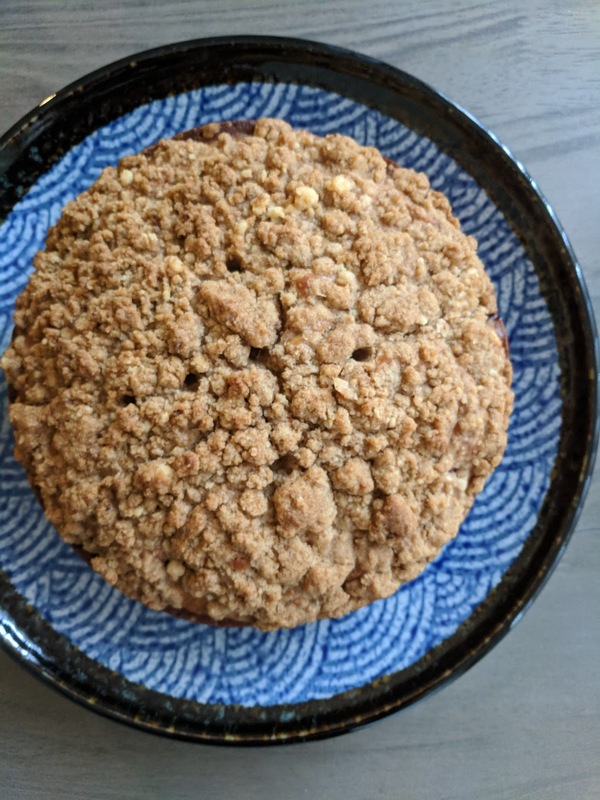 Make the crumble by whisking together the flour, light brown sugar and cinnamon in a bowl. Using your fingertips, work the butter into the dry ingredients until moistness is distributed and a crumbly mixture forms. Sprinkle the crumble evenly over the berries. Bake for 45-55 minutes or until golden brown on top and a skewer comes out nearly clean. Let the cake cool and serve warm or at room temperature. I love buying cranberries during the fall, especially since it used to be hard to find fresh cranberries. Sometimes I get overzealous and find myself with a few extra packets of cranberries when the season is over! So what to do but continue to cook with them? I usually throw the packages in the freezer and pull them out as needed. 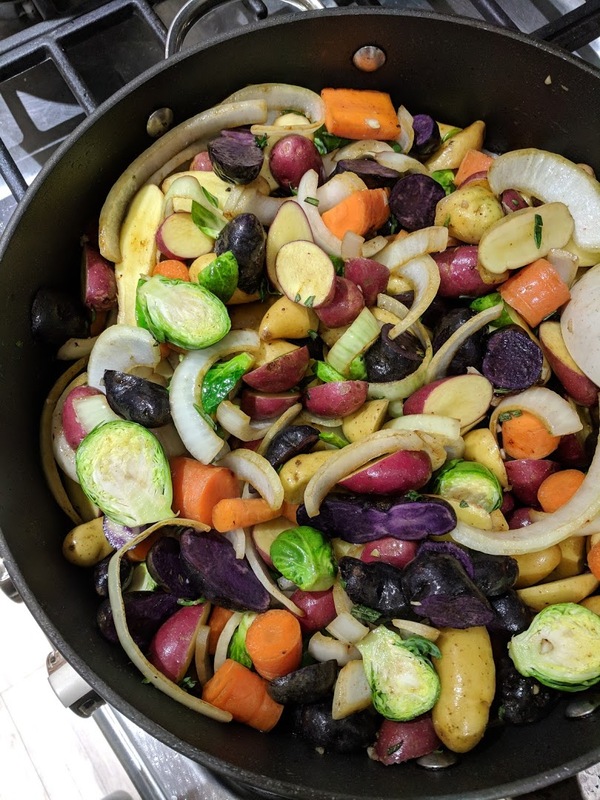 I love using the baby tri-colored potatoes shown above, simply because they're pretty. 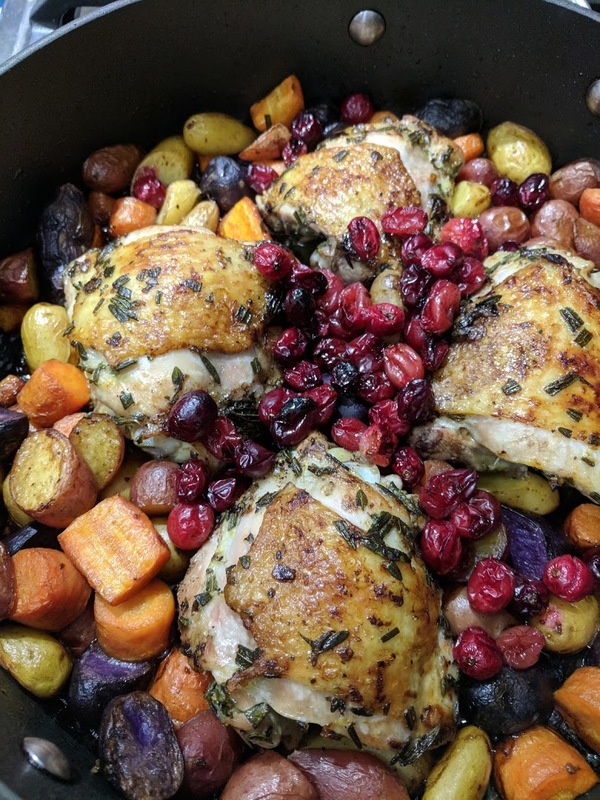 The medley of colors in this dish is insane and would make a great presentation for an dinner party, or just a cozy dinner with your family/friends. The fact that it's one pan is also helpful! Trim extra fat/skin from the chicken. Rub with 1 Tbps olive oil, thyme, rosemary, garlic and lemon zest. Really get in there with your hands and make sure everything is evenly and thoroughly coated. Season with salt and pepper. In a large oven-safe skillet, heat remaining 2 Tbsp olive oil. Sear chicken skin-side down until golden, about 5 minutes. Flip and cook 5 minutes more. Remove from skillet. Add butter, potatoes, carrots and a pinch of salt/pepper. Cook for about 5 minutes, stirring often. Pour in wine and deglaze. Scrape around for all the pan bits and flavors. Simmer for 5 more minutes, until reduced slightly. Remove from heat and nestle in chicken. Squeeze lemon juice all over. In a small brown, toss together cranberries, sugar and balsamic vinegar. Sprinkle cranberries over the chicken and transfer pan to oven. Roast for about 20-25 minutes, until chicken is cooked and potatoes/carrots are tender. Serve hot. * if you are me and love flavors AND your chicken is a bit on the oily side, you can make ANOTHER dish for the next day. 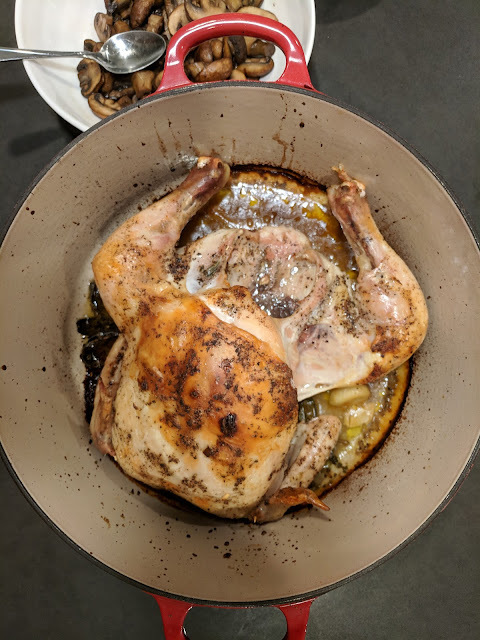 We ate the chicken and veggies but didn't use any of the "sauce" at the bottom of the pan because the chicken fat, butter and oil combination made it a bit greasy. I scooped out the chicken and veggies, leaving as much of the sauce behind as I could. 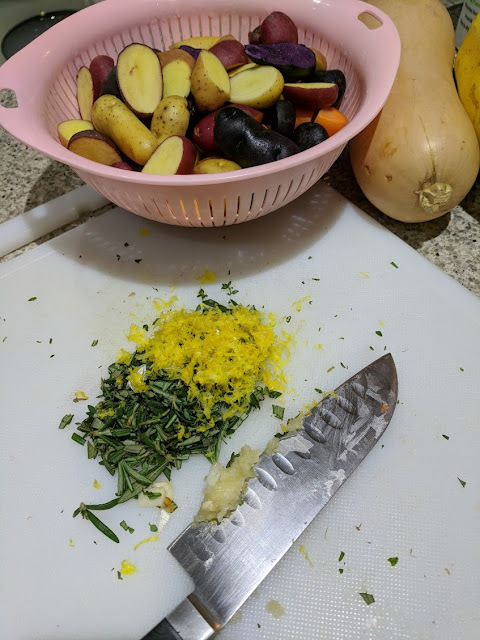 I bought another pound of tri-colored potatoes (halved), 10-15 brussel sprouts (halved), 3 carrots (cut into 1" pieces), and 1/2 onion (sliced) ... and tossed all those together with the flavor bits and chicken fat at the bottom of the skillet. There should be plenty to go around but if you need to, add a couple more tsp of olive oil. Season with salt and pepper, then roast in oven for about 30 min or until tender, stirring once halfway through. Two dishes for the price of one, and just as pretty. I loved it! Feel free to use whatever veggie combinations you would like, including cauliflower, turnips, butternut squash, etc. OR my other new favorite thing to do is roast leftover crudite platters from parties! Most of the time, there is so much food that the crudite platter is barely touched. Everything is already basically cut up so you can just throw and roast. But feel free to cut into more manageable pieces for stuff like baby carrots, celery and radishes (which I've also discovered is great when roasted). 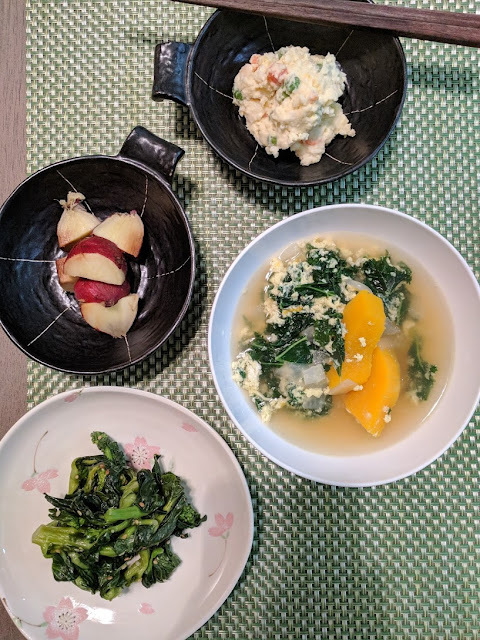 Ignore all items in the photo except for the soup on the right hand side! The other items were just part of dinner ... Korean potato salad, some veggie that I love but cannot seem to find the name for, and a baked sweet potato. This stracciatella soup is courtesy of Bon Appetit and is very very low maintenance for nights where you don't want to do too much. But you want soup! Because it's cold! Or as cold as Southern California gets. Heat oil over medium heat in a large pot. Cook onion and garlic until translucent, about 5 minutes. Season with some salt and pepper. Add chicken broth, water and butternut squash. Add some salt and pepper, then bring to a boil. Lower heat and simmer for about 5-7 minutes, until squash is tender. Add kale, stir thoroughly and let everything cook together for another 5 minutes. Whisk cheese into beaten eggs along with 1/4 tsp salt, in a small bowl. Stir the soup with a spoon and then slowly drizzle in egg/cheese mixture, from about 6 inches from the top of the pot. Let sit for about 15 seconds, then stir thoroughly into the egg-size pieces you prefer. Less storring means bigger ribbons of egg and more stirring will break them up more. I did a pretty thorough stirring so my eggs look more broken in the photo above. Season with some red pepper flakes and additional salt and pepper. The cheese in the eggs are salty as well so use a light hand at first. Remove from heat and stir in chicken. Serve with bread and additional cheese, if desired. * I find that supermarkets are charging 4-5x the cost of butternut squash, just to peel and cube it for you ($0.99/lb in its original form vs $3.99/lb in prepared form). DON'T FALL INTO THAT TRAP! Buy a medium-sized butternut squash (about 3/4-1 lb) and peel it with any vegetable peeler. Using your largest kitchen knife, slice it in half on a sturdy service. Be careful not to cut your fingers off. Remove the seeds with a sturdy spoon. They're kind of like pumpkin seeds. Slice off the stem and bottom, then place cut-side down on a cutting board and cut into 1/2 in slices. This is the easiest chicken recipe using the cold oven method, which I have only recently heard about. 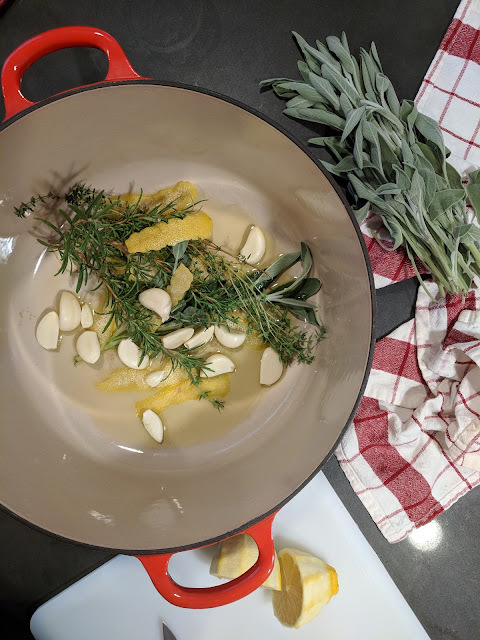 So let's get started with your ingredients: an entire chicken (or 4 bone-in, skin on chicken breast halves), 4-5 sage leaves, 2 sprigs thyme, 2 sprigs rosemary, 2 heads of garlic (peeled), one lemon (zest in strips using a vegetable peeler, pepper and coarse sea salt. Rinse chicken, remove innards and pat dry with paper towels. Rub chicken all over with coarse sea salt, including the inside. Also slip your hand underneath the breast skin and rub salt between the breast and skin as well. Set aside for 15 minutes to "brine" and prepare your pot. Take a lidded, oven-safe pot and coat the bottom with 2-3 tablespoons of olive oil. Throw in all the herbs, garlic and lemon zest strips. When the chicken is finished brining (optional: the longer the better, overnight if possible) (I used the brining time to peel all the garlic and prepare the herbs), plop it on top of your herb mixture. Squeeze the lemon juice all over the chicken and do a final sprinkle of salt and pepper over the chicken. Put lid on the pot and slide it into the oven. Turn to 450 degrees F and bake for 45 minutes. Remove lid and bake for another 15 minutes to brown to top. Remove from oven and allow to rest for 20 minutes before eating (either warm or room temperature). The chicken was so juicy and tender this way! The garlic was melted and soft underneath, which accompanied the chicken nicely. The pan juices worked really well over rice, but you may want to skim the fat from the top first (there is possibly a lot of fat, due to the chicken skin). 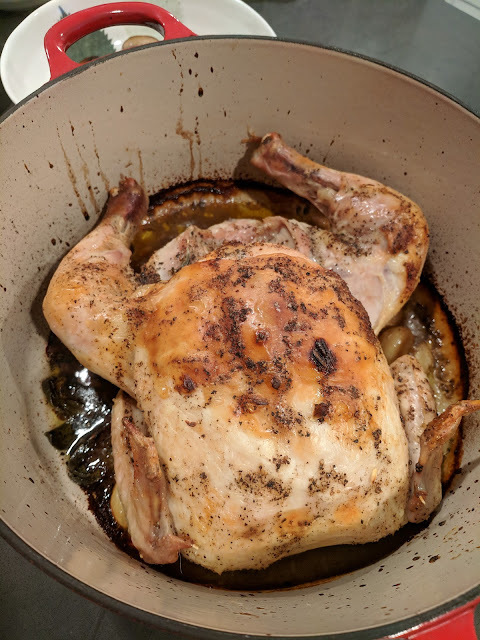 I love roasting chickens but the issue I have is that you oftentimes have to put down pats of butter on top of the breast to keep it moist, as well as rub the entire chicken down with olive oil. 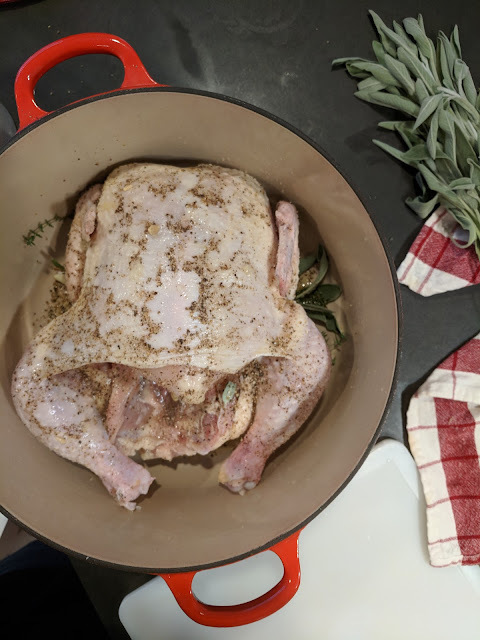 That does give the crispy skin and texture, plus golden browning, that people are looking for in roasts - this method seems to give a more healthy, daily-eating alternative. Give it a try and see if you like it! I am a convert for real.